St. Patrick’s Day may be over for another year but Irish Distillers Pernod Ricard, maker of the world’s No.1 Irish whiskey, Jameson, is continuing its celebrations having been named Whisky Distiller of the Year at the Icons of Whisky Awards - Global 2013, for the second year running. Further success followed as Redbreast 12 Cask Strength scooped the Best Irish Pot Still award. The awards underline an impressive year for Irish Distillers, with sales of its flagship whiskey Jameson reaching four million global cases. Other recent highlights include the successful launch of Yellow Spot into the Single Pot Still range, as well as the launch of the coveted Midleton Single Cask Releases in February this year. Last week’s accolades follow a host of recent award successes for Irish Distillers Pernod Ricard, including Whisky Advocate awarding the company Distiller of the Year and its single pot still whiskey, Yellow Spot revealed as its ‘Irish Whiskey of the Year’. 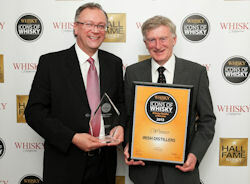 Irish Distillers also won a trophy at The Spirits Masters in November 2012.